Kevin Spacey, Jeremy Irons, Stanley Tucci - the litany of A-listers loaded into "Margin Call" is as lofty as you'll find in any motion picture but what has the premise to be an Oscar-contender turns out to be further proof (see: Ides of March) that a gaggle of all-world actors doesn't guarantee an award-worthy picture. The fictionalized take on the origin of the current financial mess takes an "Up In The Air" approach off the bat - folks getting the boot from an NYC investment bank - Tucci one of the the castoffs. Unbeknownst to the company, Tucci has been doing some research that is about to bring the place down - but no worries, Spock has been sparred to save the joint. Newly-out-of-the-closet Zachary Quinto plays a MIT genius that puts the pieces of the puzzle together and sets in motion the agonizingly-long "what-in-the-heck-do-we-do-about-this" portion of the flick. In fact, 90% of the movie is "what-in-the-heck-do-we-do-about-this" with random punchless scenes sprinkled in to slow things down to a near crawl (Paul Bettany standing on the ledge of a building - Penn Badgley weeping in a bathroom stall). Rookie director J.C. Candor is in way over his head - doubling as the writer of its largely zipless script. The best portion of "Margin Call" - the frenetic sell-off - lasts all of about 5 minutes tops. Given that "Margin Call" has a cast that is capable of delivering epicness - it's an utter shame that it didn't land in the hands of a more capable, veteran director. 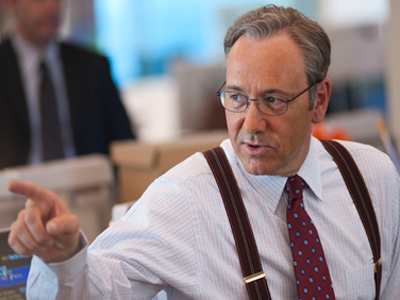 As it is, "Margin Call" can't beat the street - missing the mark in a major way given the massive expectations.